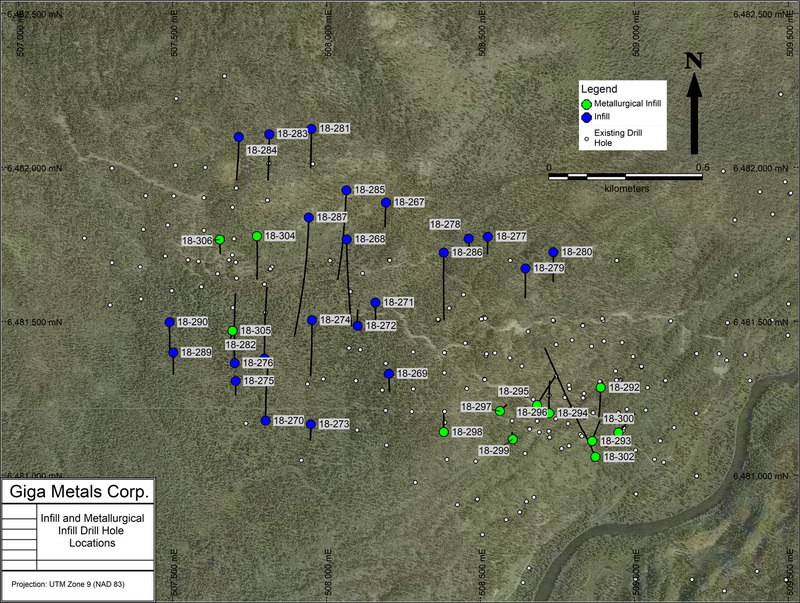 (Vancouver) – Mark Jarvis, CEO of Giga Metals Corp. (TSX.V – GIGA) today announced analytical results from 38 of 40 holes drilled in 2018 on the Company’s Turnagain Nickel/Cobalt Project. The Company is still awaiting assay results from one infill hole and one metallurgical infill hole, and these results will be announced when received. 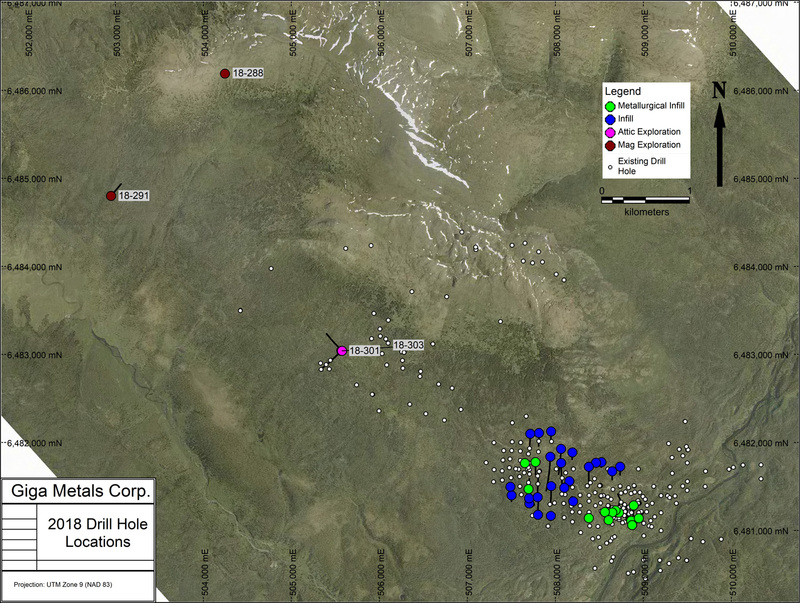 Thirteen metallurgical infill holes totaling 3,073.0 metres within the Horsetrail and Northwest zones of the Turnagain deposit. Twenty-three infill holes totaling 5,866.9 metres sited between the Horsetrail and Northwest zones of the Turnagain deposit. Two exploration holes totaling 1,119.8 metres in the platinum-enriched Attic Zone. Two exploration holes totaling 775.1 metres in the MAG zone roughly 5.6 kilometres northwest of the Horsetrail zone. This release provides analytical results from 38 of 40 holes from the 2018 drill program and the Turnagain Project. The drill program, conducted with two skid-mounted drill rigs and one helicopter-supported drill rig, commenced on July 14, 2018 and ended October 6, 2018. The infill drilling program was conducted with two skid-mounted drill rigs in the Horsetrail and Northwest zones. Although these drill holes provide valuable additional geological and resource modeling information, their primary purpose was to collect material of appropriate characteristics for future metallurgical testing. Drill core samples from this program were one-quarter NQ core. 1NW: Northwest zone; HT: Horsetrail zone; EOH: end of hole. Infill program holes were drilled at various angles into continuous or near-continuous disseminated mineralization. The infill drilling program was conducted with two skid-mounted drill rigs in the Horsetrail and Northwest zones in areas of Inferred resources. Drill core samples were one-half NQ core. 2NW: Northwest zone; HT: Horsetrail zone; EOH: end of hole. Metallurgical infill program holes were drilled at various angles into continuous or near-continuous disseminated mineralization. The Attic zone program was comprised of two drill holes (DDH18-301 and DDH18-303) in the platinum- and palladium-enriched Attic zone roughly 3.5 kilometres northwest of the Horsetrail zone. Drill core samples from this program were one-half NQ core. DDH18-301 was drilled a few tens of metres below a previously intersected platinum- and palladium-enriched, structurally complex, suite of altered clinopyroxenites. The downhole interval of 238.00 m – 260.00 m returned an average of 316 ppb Pd and 355 ppb Pt at a vertical depth of approximately 185 metres. DDH18-303 was drilled from the same pad but in an untested northwesterly direction toward, and below, nearby Davis Creek to test a suspected fault for enrichment. DDH18-303 returned no intervals of note. The MAG zone program was comprised of two drill holes (DDH18-288 and DDH18-291) in an area of sedimentary cover rocks with anomalously high total magnetics approximately 5.6 kilometres northwest of the Horsetrail zone and outside the known Turnagain ultramafic intrusion. Both holes did not penetrate through the sedimentary cover and returned no intervals of note. Click here to view a drill hole location map for the Attic & Mag zone exploration program. Diamond drilling in 2018 was conducted on the Turnagain property using NQ diameter drill rods. Drills were oriented using a Reflex TN-14 Gyrocompass drill and, after completion of the drill hole, were surveyed using a Reflex EZ-Gyro. Giga Metals systematically inserted certified reference materials (standards) and blanks into each batch of samples at regular intervals. Samples were placed in sealed bags and shipped directly to the ALS Minerals preparatory laboratory in Terrace, British Columbia. The 2018 samples reported herein were analyzed by ALS Global of Vancouver, British Columbia. Samples were prepared by crushing the entire sample to 70% passing -2 millimetres, riffle splitting of 250 grams and pulverizing the split to better than 85% passing 75 micrometres. The core samples also underwent a robust duplicate assay program that tests rejects and pulps for reproducibility. Samples were also sent to an umpire lab. Base metal analyses were determined using the ME-ICP61 four-acid digestion method with ICP-AES finish. Precious metal analyses were determined by PGM-ICP23 fire assay method with ICP-AES finish. Analytical results are verified with the application of industry standard Quality Assurance and Quality Control (QA/QC) procedures. Greg Ross, P. Geo., a Qualified Person as defined by NI 43-101, has read and approved all technical and scientific information contained in this news release. Mr. Ross is the Company’s Turnagain Project Manager. The Turnagain Project hosts the Horsetrail nickel-cobalt deposit, a significant undeveloped nickel-cobalt sulphide deposit, located in British Columbia, Canada. Engineering and metallurgical studies are underway with an objective of producing a Pre-Feasibility study. Extensive metallurgical work indicates a clean concentrate grading 18% nickel and 1% cobalt is reliably achievable using simple "off-the-shelf" processing technology. Neither TSX Venture Exchange nor its Regulation Services Provider (as that term is defined in policies of the TSX Venture Exchange) accepts responsibility for the adequacy or accuracy of this release. No stock exchange, securities commission or other regulatory authority has approved the information contained herein. This news release contains forward-looking information which is subject to a variety of risks and uncertainties and other factors that could cause actual events or results to differ from those projected in the forward-looking statements. Forward looking statements in this press release include the completion of a Pre-Feasibility Study. These forward-looking statements are subject to a variety of risks and uncertainties and other factors that could cause actual events or results to differ materially from those projected in the forward-looking information. Risks that could change or prevent these statements from coming to fruition include changing operational costs for mining and processing; increased capital costs; the timing and content of upcoming work programs may be interrupted or delayed; geological interpretations based on drilling that may change with more detailed information; the availability of labour, equipment, infrastructure and markets for the products produced; and despite the current expected viability of the project, conditions changing such that the minerals on our property cannot be economically mined, or that the required permits to build and operate the envisaged mine cannot be obtained. The forward-looking information contained herein is given as of the date hereof and the Company assumes no responsibility to update or revise such information to reflect new events or circumstances, except as required by law.